Cheese-loving consumers will soon see their dreams turned into advertising in a new integrated advertising campaign for Ornua UK-owned cheddar brand Pilgrims Choice, created by Above+Beyond. 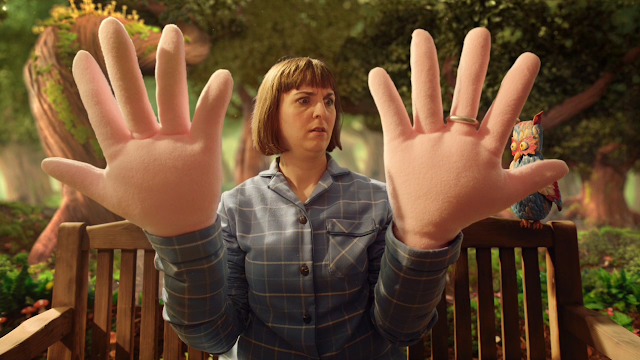 The TV launch film, “Charlie’s Dream”, blends live performance, puppetry and CGI to recreate a consumer’s real dream, which was one of many dreams sourced from cheese lovers across the UK. The ad kicks off “Cheese Dreams”, an integrated campaign for Pilgrims Choice, which is the UK’s number two branded cheddar. The strategy was inspired by research into the naturally occurring amino acids in cheese, which indicates that the idea of eating cheese at night leading to vivid, unusual dreams may be more than an old wives’ tale; and that a strong cheddar is more likely to have this effect. The film shows a dreamer who finds their arms growing incredibly long until they are able to reach through the sky to a restaurant nestling in the clouds, which they then grab and put on their head, like a very strange helmet. Inside is a tiny pub, where a pirate whose beard is made from socks sits before a very cheesy feast – including a cheeseburger and cheese on toast that are both able to walk around. The social and out-of-home campaign breaks on 21 May, followed by TV at the beginning of June as part of a major push that also includes print and in-store promotions. For the social element, consumers will be invited to submit their own cheese-fuelled dreams for a chance to see them turned into animated .gifs. Along with the TV ad and other campaign assets, Above+Beyond has created a ‘making of’ film, showing how much work went into creating the sets, puppets and miniature pub. Media for the campaign is by Yonder.